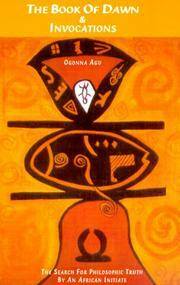 The Book of Dawn and Invocations: The Search for Philosophic Truth by an African Initiate. London: Karnak House, 1997. Glossy Pictorial Wraps AS NEW in WRAPS 8vo (5-1/2 x 8-1/2), 149 pp. Paperbound book is FINE -- Unmarked, Unread, and AS NEW in AS NEW glossy pictorial wraps. (h) The author -- a Nigerian poet and playwrite and university lecturer, was initiated by a traditional master into the teachings of Igboland, using Igbo language and culture. He tells, in the Introduction, how he was fascinated by the similarities between Igbo tradition and that of the ancient Egyptians. Dual language book in English and Igbo. 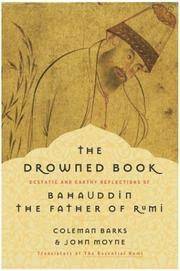 The Drowned Book: Ecstatic and Earthy Reflections of Bahauddin, the Father of Rumi. By Bahauddin Valad (1150-1231); Translated by Coleman Barks and John Moyne. San Francisco: HarperSanFrancisco, 2004. First Edition, First Printing 1/4 cloth AS NEW in AS NEW DJ 8vo 5-3/4 x 8-1/2), 149 pp. Hardbound book is UNREAD and AS NEW except for a black remainder mark. Jewish and Gnostic Man (Eranos Lectures, No 3). By Quispel, Gilles; Scholem, Gershom. Dallas: Spring Pubns, 1986. First Edition Printed Wraps Very Good + in Wraps 4to (7 x 10), 46 pp. Paperbound book is VERY GOOD (corner bump on top of pages), in VERY GOOD paper wraps (faint diagonal corner crease on front, back has a small -- 1/2" x 3/4" -- dark square on left by small price tag, also some small soil spots.). Includes Gilles Quispel's "The Birth of the Child -- Some Jewish and Gnostic Aspects," and Gershom Scholem's "Three Types of Jewish Piety." Dallas: Spring Pubns, 1986. First Edition Printed Wraps Fine in Near Fine Wraps 4to (7 x 10), 46 pp. Paperbound book is FINE, with paper wrap NEAR FINE (faint diagonal crease on front, tiny bump-curl on lower right front corner). Consists of two lectures: Gilles Quispel's "The Birth of the Child -- Some Jewish and Gnostic Aspects," and Gershom Scholem's "Three Types of Jewish Piety." 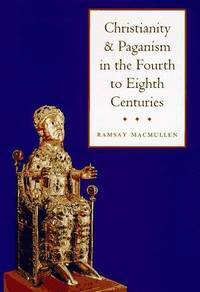 Christianity and Paganism in the Fourth to Eighth Centuries. 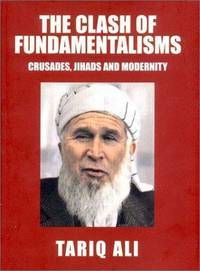 The Clash of Fundamentalisms: Crusades, Jihads and Modernity. London: Verso, 2002. First Edition, First Printing 1/4 cloth AS NEW in FINE DJ 8vo (6-1/2 x 8-1/4), 342pp including Index and Appendix: On the Israeli-Arab War. Unread, unmarked, unclipped, AS NEW in FINE (slight shelfwear) pictorial DJ with altered photograph on cover showing George W Bush with beard and turban. Book is 1/4 cloth red boards - white spine with red metallic type on spine. From the DJ picture on, Mr Ali demonstrates the current so-called "war on terror" to be a re-emergence of the Crusades -- a clash of religious points of view, with both sides having regressed to fundamentalist absolutist views, and with both sides refusing to publicly admit what the real issues are -- religious war and the spoils (oil, water, military bases, hegemony) that come from it. His perspective is obviously from the left (Mr Ali is editor of The New Left Review), but his points are well-taken. A brilliant work with enough arguments that ring true to make it a valuable contribution to the ongoing debate. 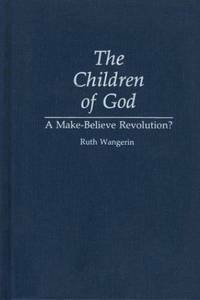 The Children of God: A Make-Believe Revolution? Westport, CT: Bergin & Garvey, 1993. First Printing Cloth As New 8vo (6 x 9-1/2), 233 pp with Index, Bibliography, and Glossary. Hardbound in blue-green cloth wth title and author's name in white, AS NEW w/out DJ as issued The Children of God was founded by David Berg in 1968, a Christian evangelical group that spread out across the world. This book was completed and published in 1993, just before Mr. Berg's death. The group was controversial and rumors of child abuse, both sexual and disciplinary were common, and while some members allowed as that might have happened before 1988, when it was formally disavowed (it never having been acceptable before). Nothing was ever proven, and the group has gone through many changes since then. They had become The Family in 1982 and continued as such until 1994, reorganizing after Mr. Berg's death. Ms Wangerin was raised in the group and in doing the book was again in contact with many of the people she'd known growing up, a situation bringing many pleasant reunions, despite the fact they knew she was writing a book that would be read by the outside world. She knows and relates the spiritual beliefs and practices without any of the sensationalism of other accounts. 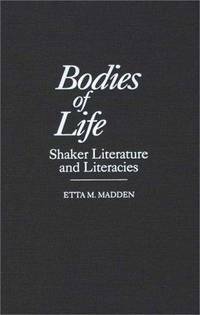 Bodies of Life: Shaker Literature and Literacies. Westport, CT: Greenwood Press, 1998. First Edition, Second Printing Cloth As New 8vo (6 x 9-1/2) 191 p w/Index and Works Cited. Hardbound in Dark Blue-Grey cloth, title and author in white, AS NEW, no DJ as issued. The Shakers have a surprisingly broad and varied history of writing. Apparently, and in accordance with church dogma, what was correct to be written depended on which person was doing the writing, this an extension of the belief -- unique among sects in America -- of paraousia, the "being present" of the Deity and Divine spirit, that what was written would, of natural course, embody the divine spirit. Naturally, much of the writing is about the founder, Mother Ann Lee, and her suffering from the time she founded the movement in 1780, and publicly began her testimony against the flesh. The Shakers were a persecuted group through their first decades, reached their peak of membership of about 6,000 in the mid 1800's, and then steadily declined in numbers, partially based on their celibacy -- no offspring to continue -- and partially because such harsh self-denying aspects as celibacy was not attractive to otherwise spiritually-interested people. An excellent work that offers a picture of the Shakers as much more varied than might be thought. Number 52 in the "Contributions to the Study of Religion" series.